Minerals are naturally occurring inorganic compounds of specific chemical composition and crystal structure. Their nomenclature typically stems as an honorific, to indicate a pertinent geographic area or to highlight a distinctive characteristic of the compound. The term asbestos collectively references a group of naturally occurring fibrous minerals which have been exploited in numerous commercial and industrial settings and applications dating to antiquity. Its myriad uses as a “miracle mineral” owe to its remarkable properties of extreme resistance to thermal and chemical breakdown, tensile strength, and fibrous habit which allows it to be spun and woven into textiles. Abundant in nature, it has been mined considerably, and in all continents save Antarctica. The nomenclature concerning asbestos and its related species is complex, owing to the interest held therein by scientific disciplines such as geology, mineralogy and medicine, as well as legal and regulatory authorities. The silicate minerals may have fibrous and nonfibrous habits. The group of asbestos and “asbestiform” minerals shares the common features of occurrence as flexible polyfilamentous bundles, long fiber length, and small fiber diameter. As fibrous silicates, asbestos minerals are broadly classified into the serpentine (chrysotile) and amphibole (crocidolite, amosite, tremolite, anthophyllite, actinolite) series, both of which may also contain allied but nonfibrous forms of similar or even identical chemical composition, nonpathogenic to humans. As such, amphibole minerals in the non-polyfilamentous habit are not classified as asbestos, nor are some other asbestiform amphiboles which are not commercially exploitable. Although generally grouped, classified, and regulated generically as asbestos, the serpentine and amphibole groups have different geologic occurrences and, more importantly, significant differences in crystalline structures and chemical compositions. These in turn impart differences in fiber structure and dimension, as well as biopersistence, leading to marked differences in relative potency for causing disease in humans for the group of minerals known as asbestos. Derived from the Greek term for “unquenchable” or “indestructible,” asbestos is the collective term for a family of naturally occurring fibrous silicates that exist in metamorphic, altered basic, or ultra basic igneous rock. Asbestos and asbestiform minerals are narrowly defined and classified, as will be discussed below. The asbestos minerals have found much utility owing to their common properties of thermochemical and electrical resistance, high tensile strength, and flexibility. Insoluble in water and organic solvents, its fine fibers may be spun and woven into textiles and incorporated into many other types of materials; asbestos has seen literally thousands of industrial applications. The usage of asbestos dates through fact and fable to thousands of years ago. Once believed to have almost magical capabilities, first descriptions document its usage in the manufacture of pottery in Finland ca. 2500 B.C. Additional historical attributions for early asbestos usage include cremation garments for royalty and for embalming the pharaohs of ancient Egypt. Emperor Charlemagne reportedly astonished his guests at a feast by throwing table cloths made from asbestos into a fire from which the garments would be removed clean and unharmed. Medieval alchemists termed the mineral “salamander stone” referring to a mythical fireproof animal, and during these times asbestos was used in suits of armor . Deposits of asbestos in the Ural Mountains led to the development of factories producing asbestos textiles in 1720. In the seventeenth century, fibrous minerals discovered in Germany termed Bergflachs or Bergleder likely contained amphibole asbestos, and by the mid-nineteenth century, some 20 asbestos mines were operating in Europe . In colonial America, asbestos deposits were discovered in Pennsylvania and New England, where it was woven into textiles, and chrysotile was discovered in Quebec, Canada, in 1860 . Significant commercial usage of asbestos did not occur until the latter part of the nineteenth century, with the development of demand for insulation for the burgeoning steam technology. At the turn of the twentieth century, additional applications for the useful minerals had been developed, deposits of amphibole asbestos species had been discovered in South Africa, and asbestos was once more being mined in the Urals, this time in large quantities. Commercial exploitation of asbestos was now global and full blown, and by 1980 over 100 million tons of asbestos had been mined worldwide , accompanied by the development of serious health concerns related to its usage. 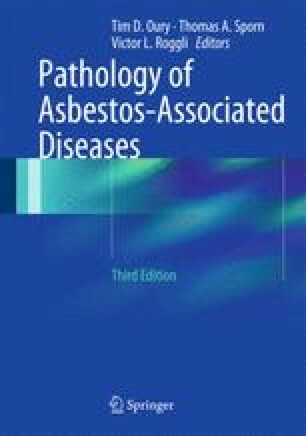 The purpose of this chapter is to describe what the groups of minerals classified as asbestos are from a mineralogic perspective, where they occur, and what are the important distinctions that allow relative differences within members of the asbestos group to have differing potencies on the basis of such differences in terms of inducing injury and producing disease following inhalation. It is well known from animal models that the oncogenic potential of fibrous dust increases following reductions in fiber diameter and decreases with reduction in fiber length, and these considerations are generally more important than the chemical composition of the fibers themselves [3–6]. The longer fibers have more potency to induce cell injury, proliferation, oxidant release, and inflammation. It is also the durability of the fibrous dust that confers biopersistence and the potential to induce malignant disease following deposition of fibers in the peripheral airways and migration of fibers to the serosal membrane. Contemporary usage of asbestos has been curtailed following its wide recognition as a most dangerous substance; it is noteworthy that the health hazards of asbestos date to antiquity as well. Pliny the Elder cautioned against the purchase of quarry slaves from asbestos mines, noting that they tended to die young . Contemporary usage of asbestos is highly variable, although global demand still measures in the millions of metric tons. The European Union, Australia, and Japan are examples of states which enforce national bans on asbestos products; other countries allow its usage and enforce variably stringent regulations on fiber type and permitted levels of exposure. In 2006, six countries (the Russian Federation, the People’s Republic of China, Kazakhstan, Brazil, Canada, and Zimbabwe) contributed to 96 % of the world’s production of asbestos [7, 8] In the USA, asbestos consumption fell to 1,730 metric tons in 2007, chiefly in the form of chrysotile-containing roofing products .